Develop the necessary skills needed to obtain competitive entry-level employment, workplace readiness, interpersonal skills, independence and teamwork, in the service industry. Acquire skills needed in the laundry and dry cleaning industries. 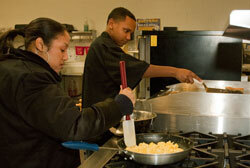 Develop hands-on skills for industrial food preparation and kitchen helper. Achieve knowledge needed to work in a cafeteria, dining room, or dish room. Utilize appropriate cleaning techniques according to industry guidelines to clean multiple areas and surfaces. Be able to stock and organize inventory, practice safety, and learn other essential skills within the distribution setting. I like to spend time with my family and friends. Both my husband and I are teachers and my daughter also aspires to be a teacher. We have two dogs and love to take them camping with us, camping is my favorite activiy. I have over 15 years of classroom teaching experience but worked in education for over 19 years–both academic and career and technology. I have served as a teacher as well as a disciplinarian. I am also an adjunct professor at Harrisburg Area Community College. I have a passion for helping students succeed in the classroom and in their lives after graduation. 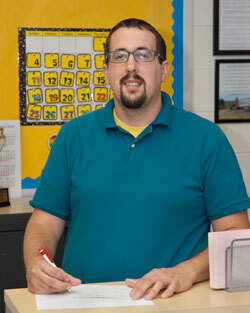 I live in the Muhlenberg community with a wonderful wife, who is also a teacher, and two energetic children. I have a strong passion for teaching and love what RMCTC represents to its community. I have been in the education field for more than six years as a TSS, an EAP tutor, a before- and after-school site director. I have taught in multiple education environments, and I have taught multiple grade levels for the Reading School District. In addition, I have more than 13 years of miscellaneous experience in general service jobs. I coach baseball and football for Muhlenberg Township Athletic Association, along with serving on the MTAA Board. I also help out with cub scouts.